How long have you been playing: My first tournament was when I was six years old. Work: I am a Mental Health Associate for Providence Willamette Falls Medical Center on the Child/Adolescent Unit. Goals in handball: To break into the top eight and continue to refine my game while doing so. I want to continue improving my left and my serve in particular. What do you love about handball: I love that handball is an individual sport that emphasizes ambidexterity. Handball is definitely the most unique sport I have ever played, and it is interesting to see how the game has changed over the course of my lifetime. Aaron announced his arrival on the Race tour with a stunning semifinals run at last year’s Houston event. Aaron became the first player to ever qualify and make the semifinals of the same event. Aaron struggled throughout the remainder of his Race 4 Eight II campaign, seemingly unable to meet the high expectations he set for himself at his breakthrough event. Aaron emphatically ended his slump with a career-defining win at the Race 4 Eight III Simple Green U.S. Open Stop #2 by defeating one of the game’s most spectacular stars, Martin Mulkerrins. Double Aaron defeated R48 I Elite 8 member Luis Cordova in his next start at the R48 III Stop #3 Houston, overcoming a 23-17 deficit to win 25-23. Aaron Garner skyrocketed into the Race 4 Eight top 12 one year ago at the WPH R48 II Stop #3 in Houston, TX. A standout junior from a handball-crazed family who started playing the game at age six, the youngest of three brothers never achieved the pro success that many anticipated. Aaron changed that with a clinical win over then #12 Vic Perez to qualify for the first time and followed that by marching into Houston’s Race semifinals with wins over Chip Morales and Anthony Selestow, becoming the first Race pro to ever qualify and make the semifinals of the event in which he qualified. Aaron’s Cinderella run would end in the semifinals at the hands of Naty Alvarado, Jr. but not before Aaron nearly handed Alvarado his first donut in Race history in game one. At 6’0 and 200 pounds, Aaron is unquestionably one of the strongest and most fit athletes on the Race tour. MMA training strengthened his resolve and at 26 years old, Aaron is just entering his handball prime. Born and raised in San Antonio, TX, Aaron moved to Portland, OR to attend Pacific University. Aaron stayed in Portland after graduating from Pacific University and works as a mental health associate for Providence Willamette Falls Medical Center on the Child/Adolescent Unit. 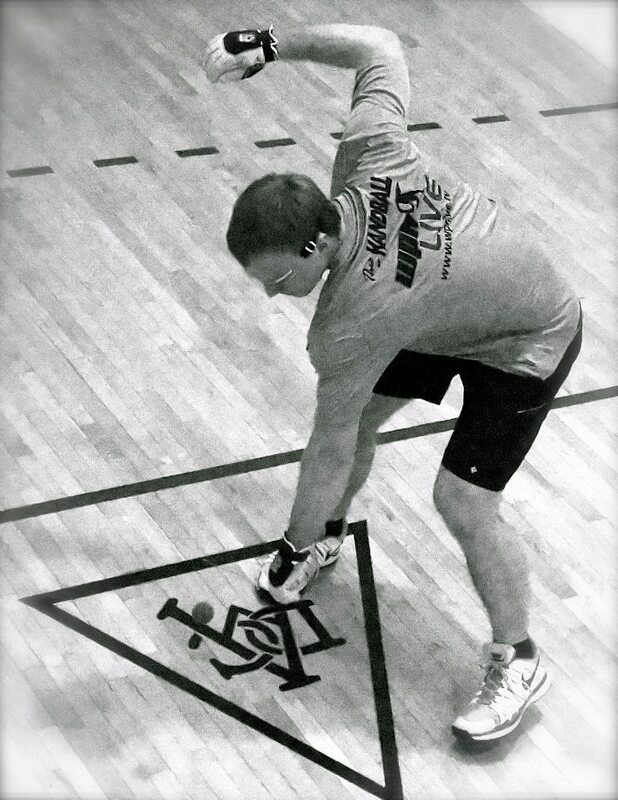 Aaron is the pride of Portland’s famed Multnomah Athletic Club, home of the 2009 World Handball Championships. Aaron trains with northwest handball standouts Matt Steele, Dalton Beall, and Cody Townsend to prepare for Race events. Aaron also trains with older brother and R48 III points leader Allan Garner during his homecoming visits to San Antonio. Aaron’s biggest tournament wins are the Pacific Northwest Regionals, a title he has won three times since 2010. Breaking into the top 8 while refining his game in the process are Aaron’s goals in handball. Unquestionably the most analytical player in the game, Aaron is always striving to perfect his form, particularly his left hand and power serve. Garner struggled in the second half of the Race 4 Eight II season, never duplicating the form that catapulted him to his first semifinal appearance. Garner emphatically ended his slump at the Race 4 Eight III Stop #2 Simple Green U.S. Open, defeating highly touted Martin Mulkerrins in two close games and earning his career-defining win. Garner’s win over Mulkerrins placed him firmly on the WPH Player’s Championship bubble heading into the second half of the Race 4 Eight III season. Garner ended the R48 II season on the TPC bubble, missing out on the Elite 8 invite by one spot. Garner is aiming to win his first round and defeat a top eight Race pro in Houston. Garner has developed entertaining rivalries with several Race stars, including Emmett Peixoto, Vic Perez, and Luis Moreno. However, Garner states that the Race pro he would most like to face is David Fink.